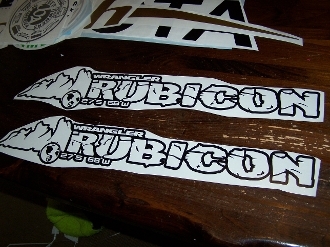 JEEP WRANGLER RUBICON OFF ROAD HOOD vinyl decals that are 4.5" high X 25" long. You get TWO DECALS. CHOOSE COLOR. THE COLOR OF YOUR HOOD WILL SHOW THROUGH THE LETTERING OF THE DECAL.